Due to recent changes in blogger, Error - We have not been able to verify your authority to this domain. 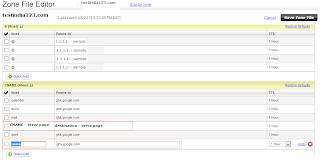 Error 12 is coming for the most of the users while configuring the new custom domain with the blogger. 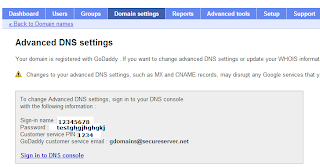 "Google Apps -- Domain registration confirmation". 3. Now, next page will open that will ask to enter your username and password for login into the gooogle apps cpanel. If you have already setup the admin account of login into gooogle apps cpanel then enter the username/password else follow the below steps to retrieve your username/password. a. Click on "Can't access your account?" link in login section. b. Google will send a mail with subject "Google Password Assistance". Click on the link given in this mail and follow the instruction.. You will be able to retrive/reset the password and login name. Most probably your login name will be "bloggeradmin". Now login to the google apps cpanel using this login name/password. 4.Now,Google apps cpanel home page will be displayed. Click on the "Domain Settings" menu available on menu bar. 6. Click on "Advanced DNS settings" link available in "Domain names" page. 7. Save this login credential somewhere to use later. 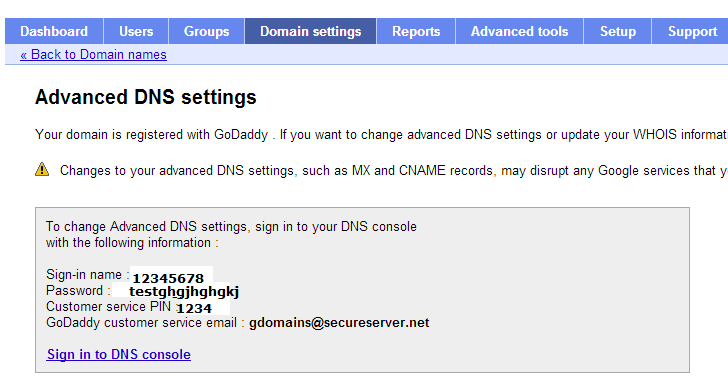 Now click on "Sign in to DNS console" link given in the above screen. Use the "Sign-in name" and password given in the above screen for login. 8. 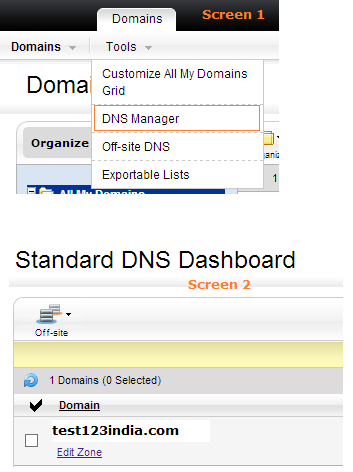 Click on "DNS Manager" menu as displayed in below screen (screen 1). Now,Next screen (Screen 2 in above image) will be displayed in new tab. CLick on "Edit Zone" link on available on wscreen. 9. Now add the two CNAME, destination(given in your error screen - "We have not been able to verify your authority to this domain. Error 12"). This can be added by clicking "Quick Add" link below CNAME section and then press "Save Zone File" button. 10. Now your verification is done, you can configure your custom domain with the blogger. Enjoy:). Nice! Have been searching high and low for a solution... Thanks! You're a life saver! Good article but I am using wordpress for my many blogs, by the way good article.